1818: Colonial Mail, Panama was part of New Granada, Red Straigh Line h.s. on folded letter to Jose Antonio Errea, Lima (Peru) m.s. "4" rate, FINE strike, January (Enero) 12, 1818. 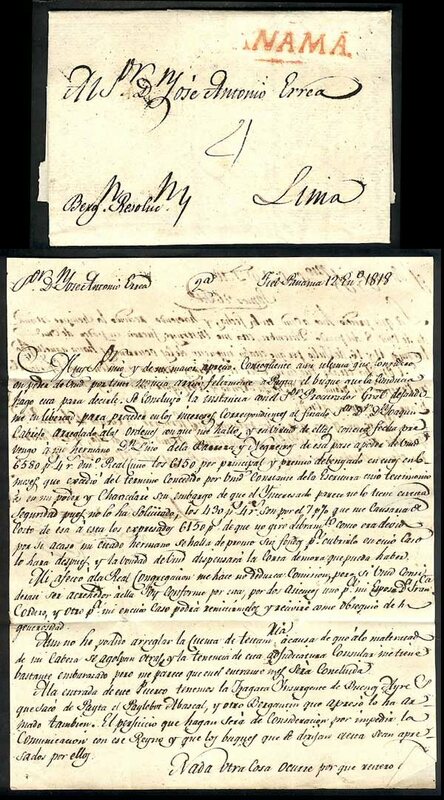 There are 13 known PANAMA frankings before 1818, 1777 being the oldest known, the others are 1785, 1792, 1798, 1800, 1807, 1808, 1808, 1809, 1811, 1813, 1816, 1816, 1818, 1820, 1820 and 1820 these are the only PANAMA recorded to date, for the Colonial Mail period.